Apple and Google like to make it as difficult as they can for you to switch to the other team - iOS or Android - but it's still very much possible. Depending on what data you want to move over, and where you have it stored, it can actually be pretty straightforward. With so many Google apps available on iOS, and so few Apple apps for Android, moving from Android to iOS is easier than going in the opposite direction, but here we'll outline everything you need to know to get your apps, emails, contacts and more moved safely. Your best starting points are actually the official tools for the job: Apple has a Move to iOS app that does a lot of the heavy lifting for you automatically while Google has a website detailing the processes you need to go through step-by-step (as we've said, it's harder to move from iOS to Android than the other way around). Pretty much everything is covered, including photos, contacts, emails, messages, web bookmarks and calendars. Whichever way you're moving, it pays to be heavily invested in Google's ecosystem. If you already have all your contacts, emails and calendars in Google's apps then you can just install those apps on your iOS or Android device and you're up and running. The same goes for apps like Google Play Music and Google Photos. Apple, of course, doesn't make email, photo or calendar apps for Android - the only account you can easily transfer over is your Apple Music one. One important part of moving from iOS to Android involves turning iMessage handling of SMS texts off before you ditch your iPhone (you can do this in the Messages section of Settings). Otherwise, you'll run into all kinds of problems with text messages getting routed to the wrong place. You can give the Apple app or the Google website a try to get some of your stuff moved over to your new platform, but we'll mention some of the key areas in more depth below. As we've mentioned, Google's apps live on the web, store your data in the cloud, and are accessible everywhere - if you already use Gmail, Google Calendar and Google Contacts on your current device, whether iOS or Android, you can just carry on using them on your new device in pretty much the same way. 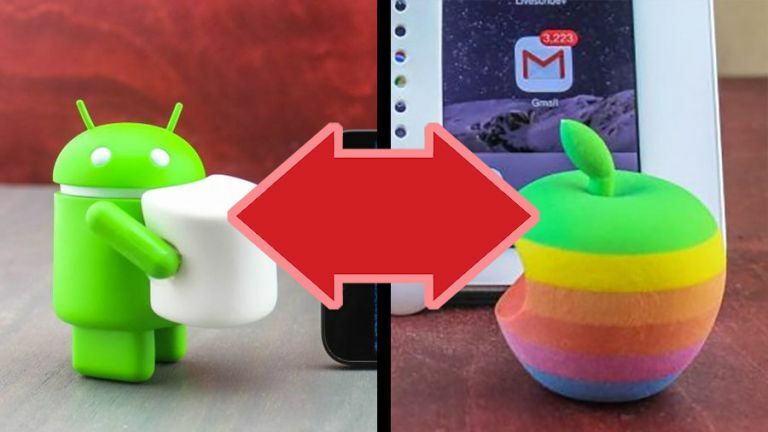 The difficulties start if you're using Apple's contacts, email and calendar systems and want to switch over to Android. For contacts, make sure they're synced to iCloud from your iOS device, then use the iCloud web portal through a browser to export them. You'll get a vCard file that you can export on the Google Contacts website. You can export your Apple calendars in a similar way. Check they're being synced to iCloud, then head to the iCloud website and choose to share all the calendars you want to get across to Android - on the link you're given, change the "webcal" string at the start to "http", paste it into your browser's address box, and you'll get an ICS file that can then be imported into Google Calendar. For email, Gmail for Android now lets you add third-party IMAP accounts, so you can set it to sync with your existing iCloud address by setting up a new account. There are a few hoops to jump through but in the end your emailing shouldn't be too disrupted. With a few exceptions, most of the apps you're already using on iOS and Android will be available on the other platform too - from Spotify and YouTube to Snapchat and Twitter. Unfortunately, there isn't a way to get a refund or a discount in the case of paid apps. If you've shelled out some cash for a particular app on your current device, you're going to have to pay again to get the equivalent app on your new platform. That might mean you need to pay for your favourite game twice. Before you make the jump it's worth checking where your data is saved and exporting it if you need to. A lot of apps, like Evernote or Dropbox, keep all your files in the cloud and so as soon as you sign in on a new device everything is there waiting for you, but there are some apps that just store data locally. Again games could be a problem, with iOS and Android both using different gaming platforms - check on game websites or with the developers to see if there's any way of transferring your progress and achievements to your new gadget. There might not be, in which case you'll have to start from scratch again with your high scores. In the case of movies, music and photos, it really depends where your content's already stored and how you want to access it. If you get at your movies through Netflix or Plex, for instance, then you can just carry on using these apps after you've switched. If you have movie files locally stored somewhere, and in a format free from DRM (Digital Rights Management that locks them to a certain device), then you can just import them into iTunes (if you're moving to iOS) or load them up in an app of your choice (if you're moving to Android). The only real issue is movies and TV shows you've bought from iTunes and which are locked to your Apple ID - there's currently no way to get this content on Android. Music is slightly easier, as long as there's no DRM attached. For iOS you can import your music into iTunes from wherever it is at the moment, and for Android you can upload your iTunes library to the Google Play Music cloud. If you just use Spotify, meanwhile, then obviously switching is very simple indeed. As for photos, it's not always easy to get pictures out of Apple's locked-down apps, either on the desktop or on mobile. If you're looking to switch to Android your best bet is to use an app like Dropbox or Google Photos to get all your images into the cloud before getting rid of your iOS device. Either of those two apps are also the way to go if you're switching from Android to iOS - everything is kept on the web as well as on your devices, so it doesn't really matter which platform you're using to look at them. Those are some of the basic issues to think about when switching from iOS to Android or vice versa, but everyone will have their own individual setup - just ensure you've thought about where all of your data, content and files are before you make the jump. Android vs iOS: which is the best mobile OS?